Approximately 4 km long by 2 km wide, Fair Isle is the most southerly island of the Shetland group (the northernmost islands of the British Isles), lying approximately 33.79 kilometres south-south-west of Sumburgh Head at the southern end of the Shetland mainland, and approximately the same distance north-east of North Ronaldsay (the most northerly of the Orkney islands). Fair Isle's climate is oceanic in nature. In winter the weather is generally mild and often stormy. The summers are cool, damp and - at times - foggy and often breezy. Fair Isle's own weather station sends daily weather reports to the British Meteororological Office, with Fair Isle's important climate data going back as far as the 1960's. Fair Isle's sea temperature and salinity records are also taken on a regular basis. With its long run of data and important geographical position, Fair Isle is ideally situated for monitoring changes in climate and its effects on the ecosystem. There is archaeological evidence that Fair Isle has been inhabited since the Neolithic period at least 5,000 years ago. This is testament to the careful stewardship and sustainable use of Fair Isle's terrestrial and marine environment by successive generations of islanders who - unable to use up a precious resource in such a remote location and then move on to exploit another resource elsewhere - have had to take care of what they have. This is just as applicable today. Dr. George Waterston, a much-loved benefactor, bought the island after World War II and co-founded the Bird Observatory in 1948, giving the isle's economy a much-needed boost. In 1954 the National Trust for Scotland succeeded him as landlord and, through a programme of house renovation and infrastructure improvements, helped islanders to stem emigration and revitalise the community. The present population, of what is one of Britian's most isolated inhabited islands, is around 70. There are eighteen crofts ranging in size from 3 to 20 hectares. 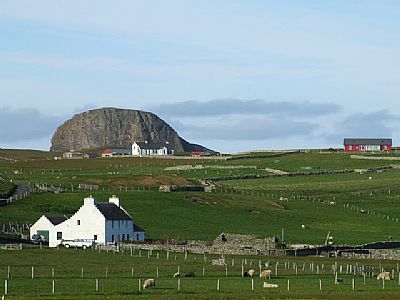 As well as traditional crofting islanders are involved in many other forms of renumerative activities, including the word-famous Fair Isle knitting, boat-building and environmental tourism, the latter of which underpins the whole island economy. Facilities. The island has a shop and post office, primary school and a resident community nurse. 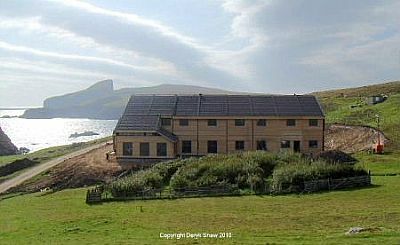 The purpose-built Fair Isle Bird Observatory and Guest House has accommodation and facilities for up to 35 visitors and researchers, including a conference room, bar and gift shop. There are also bed and breakfast accommodation outlets and a self-catering cottage and on the island. The George Waterston Memorial Centre is a fascinating museum housed in the former school, packed with displays of the island's history from prehistoric times to the present. Throughout its recent history Fair Isle has always given a warm welcome to visitors and to this end the island is well served with a modern ferry, based on the island and crewed by islanders. This, together with modern harbour facilities means that - even in winter - the island is very rarely cut off from the Shetland mainland for longer than a week to 10 days. There is also a regular air link to Shetland - more frequent in summer operated by Direct Flight using an eight-seater 'Islander' aircraft. 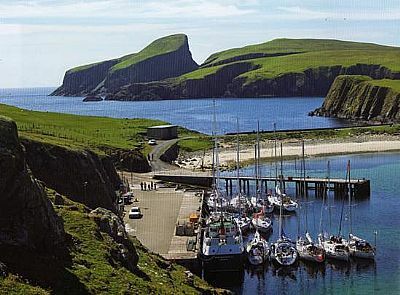 During the spring and summer months, Fair Isle is also host to a number of visiting cruise ships and a large number of yachts and occasional tall ships. The island is often host to musical, craft and other cultural and environmental events. Photo: Fair Isle native Chris Stout (Fiddlers Bid) with his band 'Brazilian Theory' giving a summer concert in the Fair Isle Community Hall in 2012. The Fair Isle Marine Environment and Tourism Initiative (FIMETI) is a partnership between the Fair Isle community, the Fair Isle Bird Observatory Trust and The National Trust for Scotland. Text and photographs Copyright Fair Isle Marine Environment and Tourism Initiative. All rights reserved.